The challenge with comparing is that we so often do it in a moralistic way, making what we compare either right and wrong. For example we might start believing that it is right to feel and wrong to think. Or that it is right to observe and wrong to evaluate,(forgetting that in that very moment we are evaluating. We might say that ”there is no such a thing as right or wrong. And if someone protests against if we get into an argument about who is right. One dialogue that can be heard during NVC-workshop breaks is one participant saying to another “But, you can’t say like that, that’s not NVC”. It’s a chilling reminder for anyone attempting to share the tools of NVC to find ways to share our them in ways that keeps the intention of NVC – connection – high. Instead of saying empathy is good and sympathy is bad we might say something like, ”To my understanding empathy more often leads to a deeper connection than sympathy“. Other things we guess most of you are also familiar with are the use of “ought to” or “should” also by people who have participated in several trainings: “I ought to understand this, I have had more than ten days NVC-training, and still I don’t get it right.” In our ambition to show people how damaging the word “should” might sometimes be we sort of indicate that “they ought not to use the word ‘should’. “Right and wrong”, “should and ought to” are powerful weapons with power to kill our curiosity. As children we learn lots of things driven by our curiosity and The basic need to understand. When we don’t understand what is happening around us, we experience mental unbalance and anxiety, something we want to avoid, usually by seeking information and by learning new skills. For a child that’s a natural way to learn. They add and assimilate new information to what they already know, without having to change their cognitive maps and are thereby hopefully able to increase their understanding. Show us a parent who never heard his or her child ask “Why?” over and over again. With grownups the process to reduce unbalance and anxiety is often more complicated than with children.
. We have our more or less completed cognitive maps and adding new information is just one of the steps necessary! We have old patterns that might get in the way of taking a new perspective. That’s an extra challenge for many NVC-trainers. Grownups don’t just assimilate.Most of us need to restructure our inner maps to learn NVC, and that is sometimes a painful and difficult process. And sometimes so clarifying and rewarding in the sense that our basic needs are met. When the learning process is painful it’s probably not going to help people connect with others or reduce anxiety. Therefor we have found it very important to use the Key Differentiations not as weapons to show that “Jackal language” is wrong and “Giraffe language” is right, but to just point out the difference between saying something in “this way” or in “that way”. 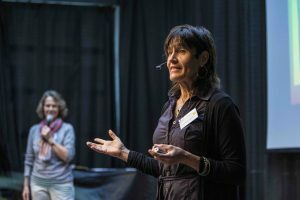 For us the Key Differentiations have become a tool to just “observe” the different concepts – those usually stored in our cognitive maps and those we as NVC-trainers think will increase our chances to connect, with ourselves and with others. Looking for the difference of two concepts of NVC is an interesting game of exploration where new depths can be tough any time you put your focus on it. As a consequence of the above we, Liv Larsson and Katarina Hoffmann, NVC-trainers from Sweden, decided to write a book clarifying some of the “Key Differentiations” in NVC. We shared the experience that during workshops and trainings, and in discussions with participants, one concept that was really important to shed some light upon, was that of “right” and “wrong”. We also shared the experience that – during our introduction to NVC – someone had “pointed finger at us” and told us “now you are up in your head” or something similar, indicating that we were wrong and not connected to our feelings. Our aim with the book – Cracking the Communication Code – has been to just describe – as in a dictionary – using pairs of words or concepts, trying to explain the not so well known concepts by using more familiar ones, giving information that hopefully adds to the already framed cognitive maps (teenagers and up) without saying that what they already “know” or what they have done so far in life is wrong, bad or shameful. We have tried to write in a way that will invite anyone to use what we have written to keep looking. The book has already proven to be a good support for a deeper understanding of NVC. We are fortunate to have a friend, Villhelm Nilson, who illustrated many of the differences. It is often done in a humorous way, a tool often successfully used to clarify information and help the brain to memorize. We have called our book “Cracking the Communication code, NVC by 42 Key Differentiations” (hoping that those of you familiar with “The Hitchhiker’s guide to the galaxy” will smile and add an extra dimension to the reading of the book: The answer is 42 but what’s the question?). The book will be available in English (January 2015), in Swedish and German it’s already available.